Bulls are controlling the EURUSD chart and today the US starts its first trading day after New Year. 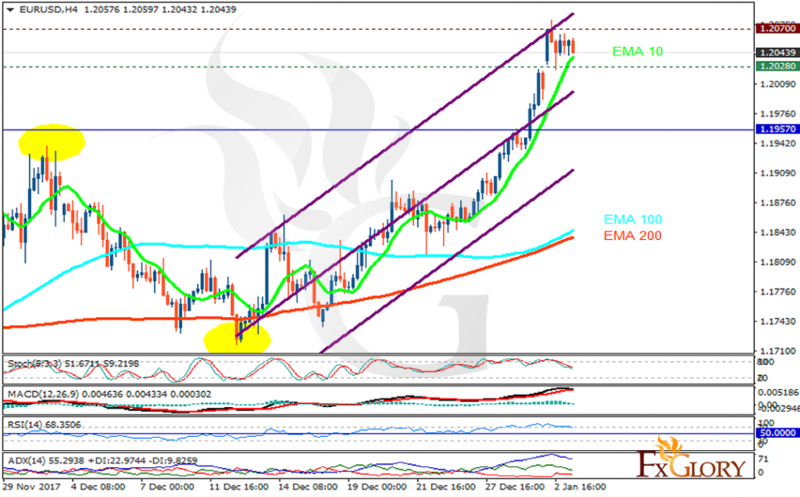 The support rests at 1.20280 with resistance at 1.20700 which both lines are above the weekly pivot point at 1.19570. The EMA of 10 is moving with bullish bias in the ascendant channel and it is above the EMA of 200 and the EMA of 100. The RSI is moving in overbought area, the Stochastic is showing downward momentum and the MACD line is above the signal line in the positive territory. The ADX is showing buy signal. 1.20 area will remain the floor of the market and EURUSD will grow towards 1.21.